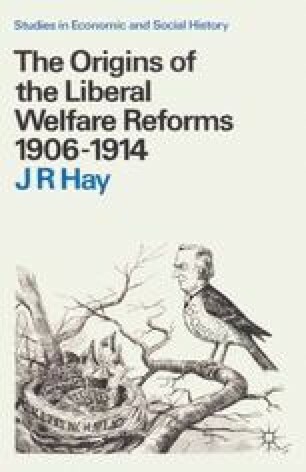 IN the history of social policy in Britain, the years between 1906 and 1914 stand out as one of the periods of major reform. Old age pensions, insurance against ill-health and unemployment, school meals, and medical services for children were introduced. Minimum wages were fixed in certain industries, and some attempt was made to alter the distribution of income and wealth in British society. Ever since, historians have been trying to explain why there should have been such a concentrated burst of activity by the Liberal governments of those years — activity which seemed to run counter to the laissez-faire individualist ideology of the nineteenth-century Liberal Party.